Happy Small Business Saturday! I got some good deals on Black Friday. As a small business owner, Small Business Saturday is important to me. 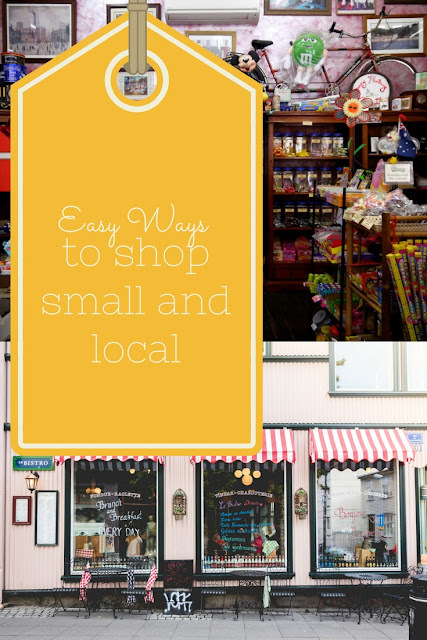 I'm going to talk about easy ways to shop small and local. Small Businesses have a personal touch and usually unique items. Gifts- Hostess and out of town gifts are some easy way to shop local. Check out your local boutiques for unique items. Some easy hostess gifts are wine and chocolates. If you have out of town guests, getting something from a local boutique that is unique to your area is a great way to introduce your guest to your area; something like that is also good for people that have moved away from your area. Wine and Beer- Alchol is an easy popular gift. My state has so many wineries and breweries. If you are getting wine for dinner, why not try a local wine? Visiting the winery or brewery is a fun activity. Many allow you to take a picnic and make a day of it and it's an awesome way to get a sampling and find something you may not have tried on your own. I love going to wine tastings. Food- While you're out shopping for gifts try a local spot for lunch. If your taking your friends out to dinner for the holidays try a local spot. You may find a hidden gem. I love my local Indian place so much I had my birthday there! Clothing- You may have a local boutique that has interesting pieces or a consignment shop. I got a great pair of jeans from my local boutique. Online- There are plenty of online small businesses. Etsy is also a great way to find handmade items. How do you shop small? I would like to do more shopping local--sometimes those places get forgotten about in all the crazy online sales. Thanks for these tips! I love giving gift certificates for experiences like dining out! These are all great ideas!